On June 20th, I visited the Essex County Clerk's office, and spoke to the County Clerk, Joseph A. Provoncha, who said that he was the sole retainer of county flag information, that, despite extensive county records (from what I observed while in the office, it was an impressive collection), none of what he told me was written down anywhere. 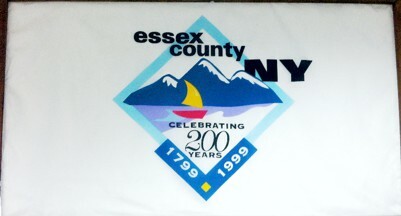 The first flag the county had was designed in the 1980s to commemorate the county's role in hosting the 1932 and 1980 Olympics in Lake Placid, New York. 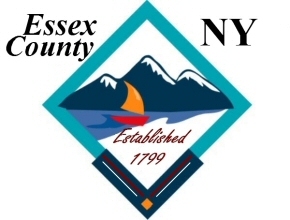 No word on the significance of the graphics on the flag, though my guess is that the mountains and evergreens are symbolic of the main landscape of Essex County, and that are so essential to the commerce and livelihood of the entire population of the county. As for the white background, it is inferred that the background of the bicentennial flag resulted as merely having been the result of needing a simple background on which to put the logo designed by Ronald Ofner. I'm sure a similar explanation is inherent to the first county flag, as it appears to be a county seal on a background with writing on the flag's background. The only reason I mention the backgrounds is because white is the color of snow, essential to both the overall description of the environment of Essex County, and likely critical to winning the 1932 and 1980 Olympic bids. However, this is very likely only a fortunate coincidence. Mr. Provoncha has stated that, despite appearing as a bicentennial flag, the second county flag is in regular use as the county flag. This flag was official until publicity director Ronald Ofner asked the Lake Placid Visitors' Bureau to come up with a logo for the county's bicentennial, and had the board patent it. The mountains, sailboat, and lake pictured on this flag likely mirror this sentiment in the original flag. Mr. Provoncha has stated that, despite appearing as a bicentennial flag, this second county flag is in regular use as the county flag.